Half term 2018 was the busiest week yet in our short history. We had over 140 guests in Klosters and it was so nice to see so many returning guests as well as welcoming new ones. We were blessed by (generally) good weather, especially in the middle days and given all the snow we have had this year the pistes were in terrific condition with absolutely everything open. 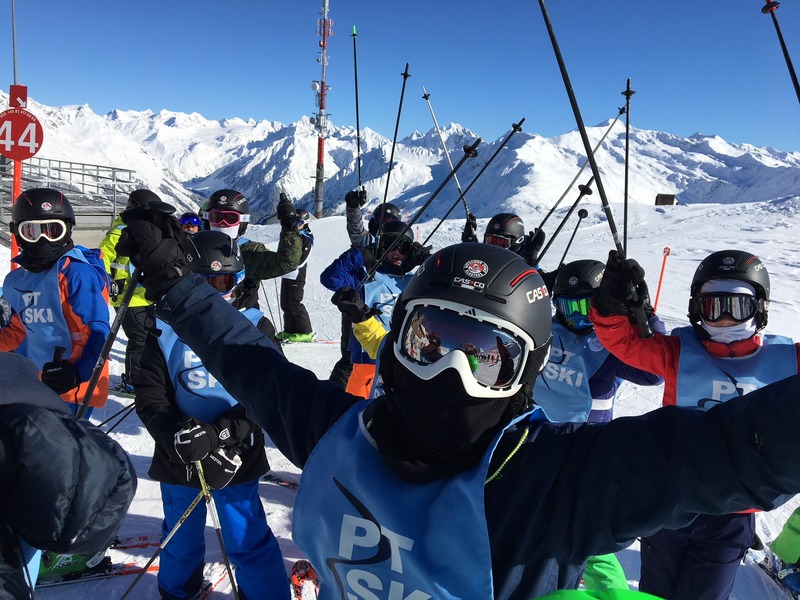 As usual we ran our 3 day PT All Mountain program for teenagers which saw a group of 14 of them head off into the Klosters back country to try their hand in the soft snow and improve their off piste skills. They covered a lot of ground and the guides found them some terrific powder, as well as introducing them to the art of ski touring. The photographs and tales they came back with certainly gave them the bragging rights in the evening! The younger children on our Piste Busters, Marmots and Pandas courses also had a great time. The highlights included the team parallel slalom race they did on the Tuesday morning and the big race (now an annual fixture) on the Friday on the Parsenn Rapide. Although we were teased by intermittent sun, the bottom part of the course remained cloudy throughout causing the commentator a few problems in trying to identify the racers! The Pandas (for our youngest skiers) had their own race and with many of them completely new to skiing this was the prime opportunity for them to show off to their parents how much they had learnt. To make all this possible we had a fabulous team to look after our guests, take them skiing on the pistes, run the children's courses and attend to the non skiers. They were all engaging and charming and shared the PT Ski company ethos of wanting to show our guests exactly what it is that we love about Klosters. We could not run half term without them. We now look forward to the rest of the season and in particular to the beginning of the Easter school holidays when we will be running another program of kids courses. We are also just starting to take bookings for half term 2019, and as a courtesy to our existing guests we will not open up to bookings from new guests after 15th April.